Coarse fishing holidays are our speciality, with a range of accommodation including static caravan holidays, touring and camping pitches and holiday cottages, Cofton really does have it all! The fishery is situated within its own idyllic grounds within the park so you are never far from your favourite swim. You can pitch your tent or caravan metres from the lake, don’t forget to book ahead to ensure you get your favourite spot. 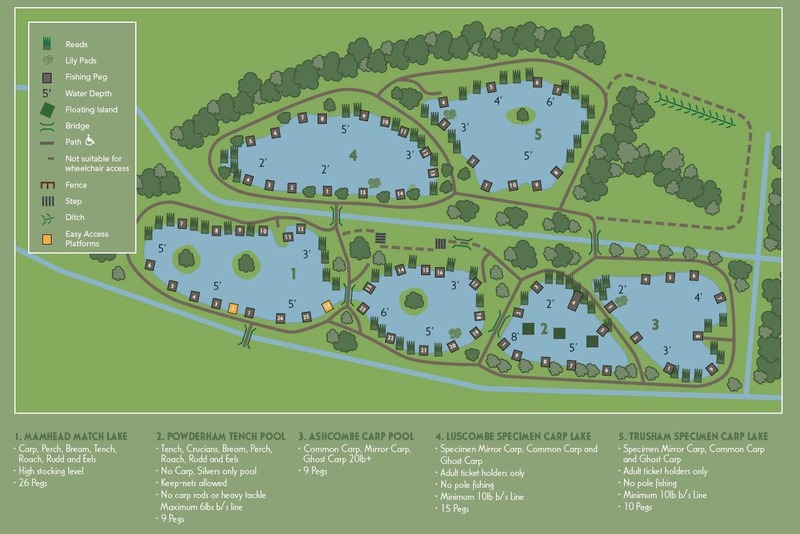 We aim to make our coarse fishing lakes easily accessible for all, with five well-stocked lakes with fish species including carp, tench, roach, bream and perch, with level access, disabled parking by the gate and family-friendly platforms. There are two Specimen Carp lakes with a good head 20lb+ fish. A dedicated Tench and Silvers pool with fish species including tench, golden tench, crucian carp, golden rudd, rudd, roach, bream and perch. A pleasure and match lake with a high stock level of Carp and Bream designed to keep both novice and experienced anglers challenged and rewarded! If competitive fishing is your thing we have the Cofton Cup fishing festival weeks in May and September plus weekly matches from April through to the end of October. An on site tackle shop with knowledgeable, helpful staff and every piece of tackle and bait you could possibly need so……Get the rods out, sit back and enjoy the peace, tranquillity and fantastic fishing our lakes has to offer. Put your skills to the test against other anglers in the Cofton Cup. The Cofton Cup returns in September 2018! A valid fishing permit is required - please purchase these from reception or the tackle shop before fishing. Throughout the year, we offer family fishing lessons to start the younger generation or those new to fishing on their journey towards a love of coarse fishing. No rod licence needed and tuition by a qualified coach. If you've never tried Coarse Fishing before, our Fishing Experience Weekends are perfect. Available to all guests staying at Cofton, expert tuition, rod and bait all included! Join Cofton’s fishermen and proudly show off your best catches. For the latest news and updates and to join in with the Cofton Coarse and Carp fishing community see our facebook page. Winter carping is good for your 'elf!